When we decided to become innkeepers, we wanted to buy a Cape Cod bed and breakfast located in an area that provided the best possible experience for guests. Having had a house on the Cape for many years, and commuting from Boston every weekend, we wanted a location that was easy to travel to from the airports in Boston and Rhode Island and for folks who come to the Cape from surrounding towns and states. Location was the most important aspect but our criteria was much greater. 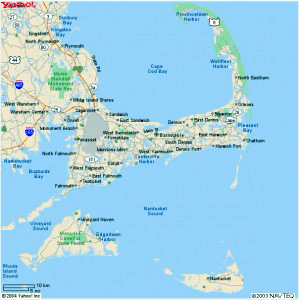 The island of Cape Cod -- and yes, it is one of the largest barrier islands in the world--is such a spectacular vacation destination with so many quaint and beautiful villages that I think it is often difficult for folks who aren't familiar with it to choose just where to stay when they are planning their trip. This was also a challenge for Charlie and me when we began our search for the village in which we wanted to live and work. There are so many reasons we chose Sandwich, and particularly the historic village area, and we want to share them with you in the hope that it will encourage you to choose it when making your decision about where to stay on your visit to Cape Cod. Aside from being the oldest and most historic village on Cape Cod, it is as the real estate slogan says; location, location, location. When staying in Sandwich, it is so easy to take day trips to any of the Cape's other villages and the islands of Martha's Vineyard and Nantucket. The rich history here, fabulous restaurants (some on the water), beaches, great shopping, museums galore, hiking and biking trails, rivers and marshes for kayaking. What more could one hope for? With the wide variety of restaurants in our village, there is something for everyone. We have one of the famous Seafood Sam's for some of the area's best fresh fish and shellfish. One of the finest restaurants on Cape Cod is located here in the renovated and re-purposed church that is the unique and elegant Belfry Bistro. We have the popular restaurant and tavern at the Dan'l Webster Inn and the wonderful Aqua Grille that is located on the Sandwich Marina with a beautiful outdoor patio for waterfront dining and a view of our spectacular sunsets. You can also have a cocktail and watch the sunset from Hemisphere Restaurant located right on town beach. We have a great little pizza parlor called Emelia's where some of the best pizza you ever tasted is made. There is the prized Cafe Chew (Sandwich's Sandwichery) for a great lunch and, for lovers of Italian food, we have Tomato's, Amari, and the Sagamore Inn. For traditional New England fare, you can have lunch or dinner at the Bee-Hive Tavern. We have two Irish Pubs; Flynn's and Bobby Byrne's. There is also a British pub and we have one of the top 10 English Tea Shops in the country in the Dunbar Tea Shop--you just gotta try their desserts. We have two of the best gourmet shops in Momo's and the Brown Jug and two great wine shops in the Brown Jug Wine Shop and Cellar 55 Wine Merchants. And, of course, you have to visit the Marshland Restaurant to try their quahog, which was named 'Best in the US' by the Food Network. And then there are our three amazing ice cream shops; Twin Acres, Sweet Caroline's, and Ice Cream Sandwich. They are only open during the summwe season but you want to try all three while you are here. You be the judge of which is the best. Right in the village are Beth's Teas and The Coffee Roost. So many of these great places you can walk to from our bed and breakfast. We have antiques shops with some of the most affordable antiques shopping on the Cape, art galleries galore, and shops with divine gift items and lovely treats for yourself. We have shops that feature local artisans and crafts people and we have the very special Spotted Cod with the most beautiful gifts and home decorating items you will find anywhere....shades of Coastal Living. We have three glass blowing studios producing world class items. After all, Sandwich is known as the ''Glass Town' with a glass making history that dates back to the 1800s when Sandwich was the world center for pressed glass making. You can learn all about that era at the Sandwich Glass Museum, just across the street from our inn. 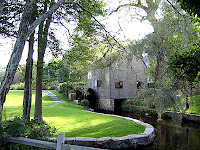 And speaking of fun things to do, in addition to visiting the Glass Museum, we have the oldest operating grist mill, circa 1654, right across the street on Shawme Pond where you can watch corn being ground during the season and buy the meal to take home to enjoy. 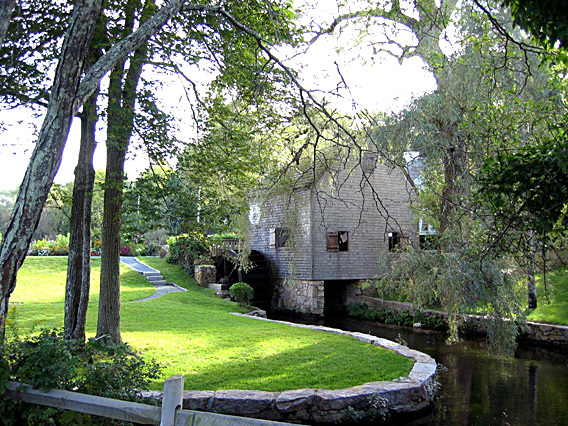 This mill is also one of the most photographed attractions in our area. And just up the street from the grist mill is the Hoxie House, the oldest completely restored house on Cape Cod where you can see how the colonials lived. Located on Grove Street, and just up the hill from our inn, is one of the crown jewels of Cape Cod, and southern New England's largest public garden, Heritage Museums & Gardens. That in itself could be a day trip. In addition to the most amazing floral and tree covered grounds, this 100 + acre horticultural garden is home to three museums, including an auto museum with one of the finest antique American auto collections in the world. It is housed in a reproduction, round, stone Shaker barn. Housed in another museum is an antique carousel that has been fully restored. Be sure to take a spin back in time. Before you leave Heritage Museums & Gardens, check out the Maze and the Labyrinth. If you are there in early summer, you will have the pleasure of walking the trails where 10,000+ rhododendrons will be in resplendent bloom. Don't miss Hidden Hollow and its tree house, believe me it's not just for kids. Another part of Sandwich's history is that Thornton Burgess, famed children's story book author, lived here. Homage is paid to this environmentalist at the Thornton Burgess Museum and at the Green Briar Nature Center. At Green Briar, is possibly the oldest operating jam making kitchen in the country. If you love making homemade jam, you may want to schedule your visit here to include one of their jam workshops. If you are like me and really enjoy visiting old cemeteries, we have several here in the village. Go for a morning walk and stop by the Old Town Cemetery just up the street, which dates back to the 1600s. The feeling that you have just stepped back in time is palpable there. 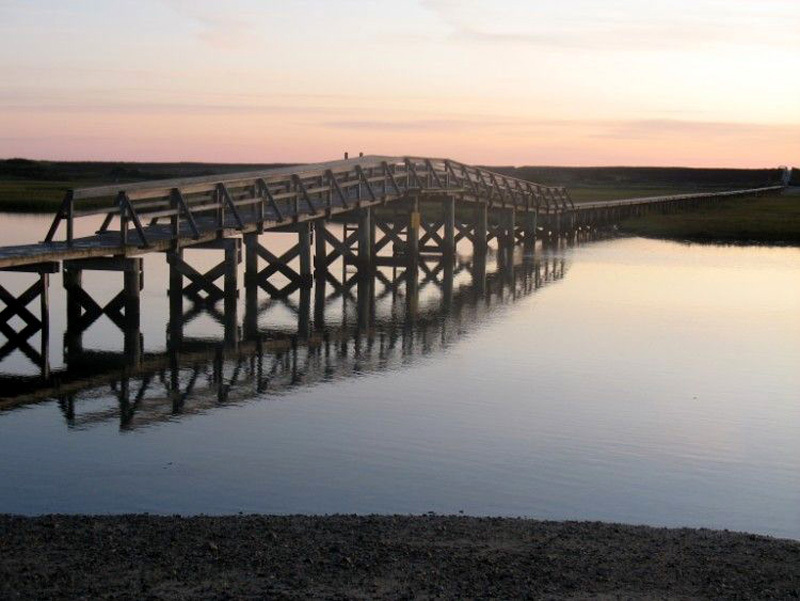 A visit to Sandwich is not complete until you have visited the Sandwich Boardwalk, which spans the marshes and mill creek and leads to the sand dunes of Town Beach on Cape Cod Bay. Just this year, our lovely boardwalk was named one of the 10 most beautiful in the world by National Geographic magazine. 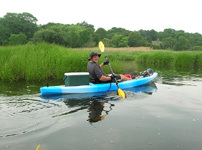 If that isn't enough to keep you happily engaged, how about an afternoon kayaking along Mill Creek and Scorton Creek or biking along the Cape Cod Canal Bike Path. You can bring you own bike or kayak or Justin at EcoTourz would be happy to rent you one and you can even schedule a kayak tour with him. There are also many trails to hike and beaches to stroll. Folks love to search our beaches in hopes for finding some small pieces of beach glass, perhaps even a particle of the illusive Sandwich glass. As I have said, Sandwich is the perfect place to call 'home' while you are visiting Cape Cod. We will give you maps and direct you to other parts of the Cape for great day trips and adventures. 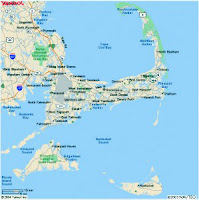 We can also help you plan your visit to the other islands of Martha's Vineyard and Nantucket. 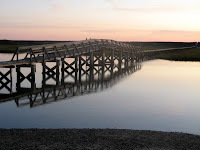 We hope you will come stay at our Cape Cod bed and breakfast and think of it as your seaside retreat while you are here.